This past winter (hopefully passed!) I had my sister in law over for a week or so. 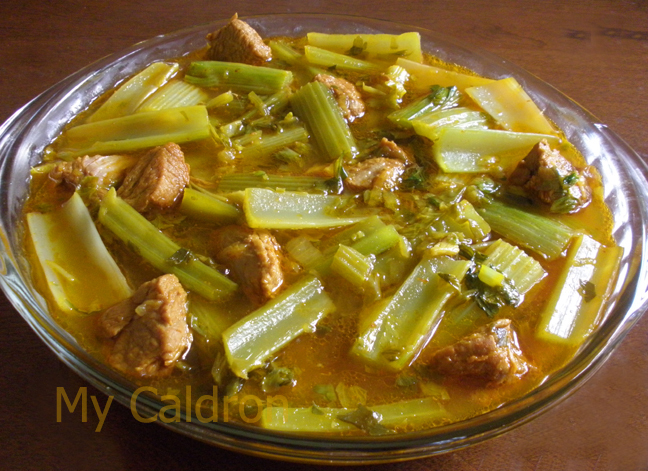 One day she volunteered to make celery stew for lunch while my husband and I had a long rough day out. I happily approved and we came home to a dizzying fragrance of steamed rice and perfectly settled hot stew with remotely detectable sent of fresh herbs and saffron. At first I thought the thrill I felt upon sensing this welcoming food had to do with not having to cook when you are hungry, but rather coming to a homey and ready to be served meal. But when we started the meal I discovered that her method for making this particular stew was completely different than mine) which I have already shared here), and I must admit far too superior to it – to my taste anyway. The proof to this last claim is that I followed her recipe and came up with the exact same delight.